Former New York Mayor says Kim begged for meeting with Trump to be rescheduled, suggests same should be done with Palestinian Authority. Former New York Mayor Rudy Giuliani, who is now a member of President Donald Trump’s legal team, said on Wednesday that North Korean leader Kim Jong Un got “on his hands and knees and begged” for his meeting with Trump to be rescheduled after Trump canceled it. Giuliani, who was speaking at a conference in Tel Aviv and quoted by Politico, recommended that the Trump administration adopt a similar approach in future peace negotiations with Palestinian Arabs. “Well, Kim Jong Un got back on his hands and knees and begged for it, which is exactly the position you want to put him in,” he was quoted as having said. Giuliani stressed in his comments on Wednesday that the U.S. would not meet with North Korea under threat of nuclear war. “They also said they were going to go to nuclear war with us, they were going to defeat us in a nuclear war. We said we’re not going to have a summit under those circumstances,” he said. 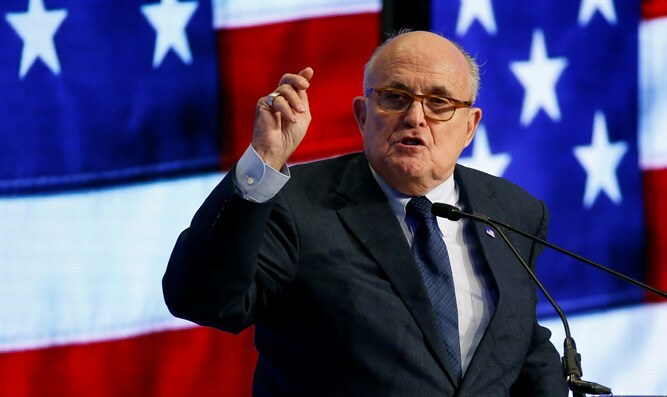 Giuliani’s comments also come as the Trump administration prepares to present its initiative for a peace agreement between Israel and the Palestinian Authority (PA). However, PA chairman Mahmoud Abbas has refused to consider the Trump administration an honest broker for negotiations ever since Trump recognized Jerusalem as Israel’s capital and moved the U.S. embassy to the city.